If you cancel 7 days before the arrival the hostel will not charge anything. 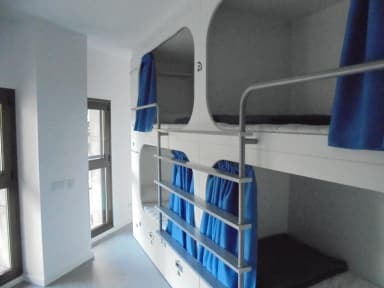 If you cancel between 7 and 2 days before the arrival, the hostel will charge the 50% of the total amount. If you cancel after the deadline the hostel will charge the 100% of the total amount. The total amount of the reservation should be paid in advanced. People under 18 have to be accompanied by an adult. The hostel is located in the most cosmopolitan quarter of the city. It is 25 meters from the famous Diagonal Avenue. Near “Francesc Macia” square, it is just a two minutes walk from the tramway and 15 minutes from the metro station “Hospital Clinic”. 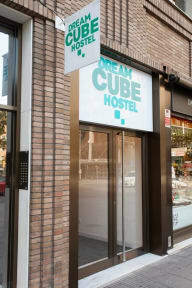 The hostel is 20 minutes away from Paseo de Gracia, where you can find the city’s main attractions, such as architect Gaudi’s buildings La Pedrera and Casa Batlló. Near to Futbol Club Barcelona stadium. The place is enabled for people with reduced mobility. Free WI-FI connection, air conditioning and heating in all bedrooms. Common area equipped with TV, computers, films, books and touristic information... Full equipped kitchen. Shuttle to the airport. Towel rent: 3.00 €. Free luggage storage. Bed linen included. Check out : 11:00 . Ik verbleef van donderdag tot maandag in dit hostel. De dagen buiten het weekend was het er erg rustig en aangenaam, de andere dagen was het er druk en dus wat meer lawaai. Alles was proper: keuken, living, badkamer en slaapkamer. Er kwam dan ook elke dag iemand poetsen. De douches waren goed en de wifiverbinding in de gemeenschappelijke delen ook, alleen niet echt in de kamer. Verder was het personeel erg vriendelijk en heel behulpzaam. Het hostel ligt niet in het centrum.